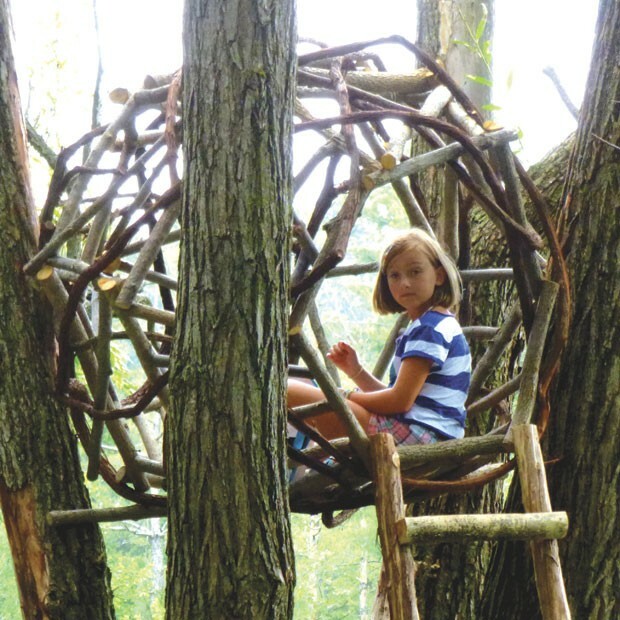 Enchanted Backyard | Habitat | Kids VT - small people, big ideas! 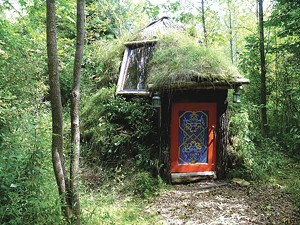 Kindergarten teacher Joplin James and his author wife, Alison, run Harry Potter-inspired Enchantment Camps, so it's no wonder their Shelburne backyard looks like a whimsical forest. The wannabe wizards who flock to their home in the summer are often diehard Potter fans. "Some of them have read the series 12 times," says James. In weeklong camps, they have the chance to act out their Hogwarts fantasies. Kids VT profiled the James' camp in the March issue, but we had to return to see more of the yard, which looks like something straight out of a fantasy novel. The Jameses — whose daughters are now 16 and 25 — have lived in their home since 1990. 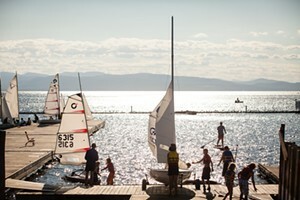 They started the camp eight years ago as a way to do something fun and creative with kids outside of school — and to make summer income in the process. They spend hours handcrafting wands, designing huge puppets and ordering special gems in preparation for camp activities. These include potion making, spell casting and playing Quidditch on a field that James has outfitted with special hoops. But, he says, campers also like to spend their time just exploring the land. In addition to the more outlandish structures pictured here, there's a chicken coop, a collection of beehives, a vegetable garden and a crooked balance beam. James humbly describes his handiwork as "folk art." To visitors, it's simply magic. Ladders lead the way to these 16-foot-high nests, which Joplin James built after seeing similar structures near Big Sur, Calif. Kids can climb up to read, eat lunch or observe nature from above. One nest is made of woven ash branches; another combines an ash platform and woven grapevine. 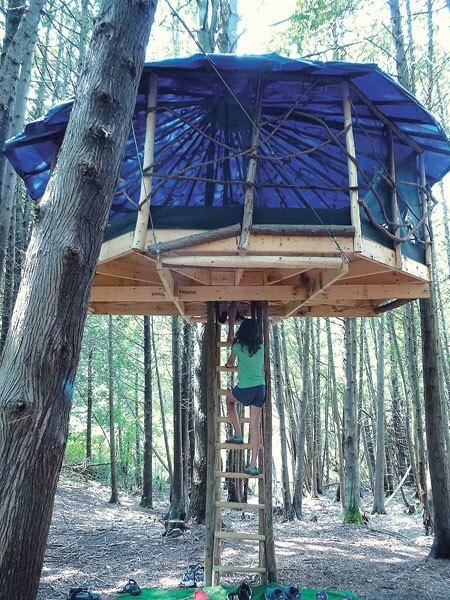 A 10-minute walk past a pond inhabited by beavers and frogs leads to this large, octagonal treehouse. Visitors climb a ladder through the center of the structure. The floor is covered with AstroTurf; a blue tarp acts as the roof. James built the structure on the ground, then hoisted it into the tree using pulleys — and the help of some strong 12- to 14-year-old girl campers. The Hobbit Hole, aka "Hagrid's Hut"
James, who has no formal training in construction, built this small house using poles made from backyard cedar trees. He draped them with a nylon material, then stacked sod on top, which now blooms with dandelions and little purple flowers. 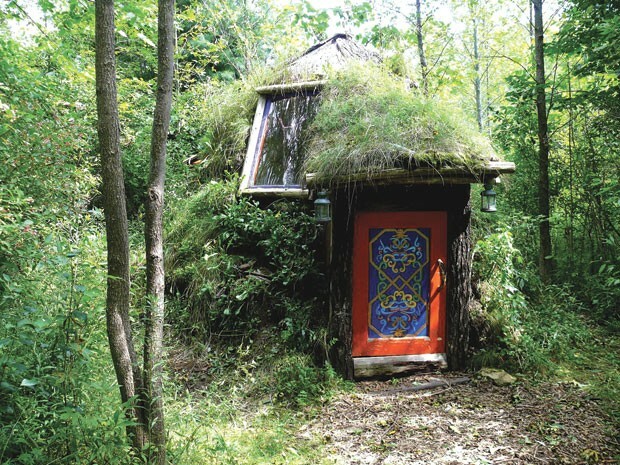 Alison James painted the small, brightly colored door that leads into a living area fit for a hobbit. There's a handmade wooden coffee table and an old woodstove, which makes the space ideal for a winter campout.